Ya Science \o/. 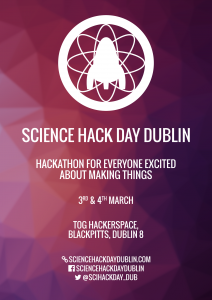 We are proud to be hosting Science Hack Day Dublin again. A 36 hr hardware and software hackathon. A social event with creativity and love of science and technology at its heart. A get together for designers, scientists, coders, engineers and makers to simply to make interesting things. Why? For adventure, for playfulness, for science! Join us on Sat, 21 Apr 2018, & Sun, 22 Apr 2018.
travelling or have little ones at home. Apply via the link below. This was written by tdr. Posted on Monday, February 19, 2018, at 5:20 pm. Filed under News, Workshops/Events. Bookmark the permalink. Follow comments here with the RSS feed. Post a comment or leave a trackback. TOG is a hackerspace based in the centre of Dublin, Ireland. It is a shared space where members have a place to be creative and work on their projects in an environment that is both inspiring and supportive of both new and old technologies. Join our mailing list.